My husband and I had always had adoption on our hearts. When I married Troy in 1990, he had just gone into remission from non-hodgkins lymphoma. We were told that we would probably not be able to have children. We knew we wanted kids and had talked about adoption early on in our marriage. We bought our house in 1992, and I learned that I was pregnant. We had three beautiful girls Morgan in 1993, Shelby in 1995 and Corbin in 1996. 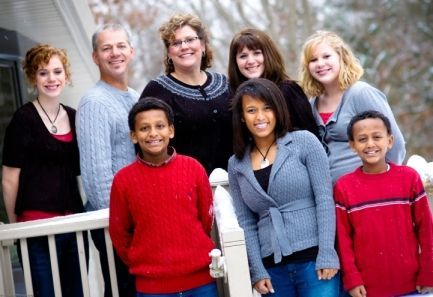 We still had adoption in our hearts and started pursuing Ethiopian adoption in October of 2003. We had initially thought of adopting younger than our 3, but, we saw Seble and Syfah on a waiting childrens video through Adoption Advocates International. We were petrified at the thought of "disrupting birth order," but felt they were our kids. As Troy prepared to travel to pick up the kids in May of 2004, I was looking over some paperwork that we had received, I noticed that the day they were brought to the orphanage, the paperwork had listed 3 names...Seble Negash, Syfah Negash and Araya Negash. I immediately called our adoption agency and was informed that there was indeed a third child. Araya was HIV+, and had been split up from Seble and Syfah when he tested positive...we were overwhelmed. We immediately asked what our chances were of adopting Araya. We were told it was not an option. When Troy traveled about two weeks later, he was able to not only meet Seble and Syfah, but bring them to the Missionaries of Charity Orphanage in Addis Ababa to re-unite them with Araya, they had not seen each other for over 2 years. They had no idea why he had been taken away. It was a bitter-sweet reunion that brought much sadness as they realized that they would still not be together. It also left a huge hole in our family. We were able to keep up on how he was doing, and we started to pursue the adoption of Araya in the fall of 2007, Araya was able to come home last June 28, 2008! It has been a year of transition, but we are making progress and Araya is adjusting everyday. Araya's HIV status is "undetectable," which is the ultimate goal. He had started meds in 2007 as he was starting to battle pneumonia and chronic ear infections. We have had one major ear surgery and Araya does wear hearing aids in both ears. We don't want HIV to define Araya or our family, but, we do want to educate and let others know that with good consistent medical care, HIV is not something to be afraid of.